Photo from a fascinating set received some years ago from Mrs. Joan Green from Lancashire (UK). They are all from an album discovered in her late great aunt's loft. The name associated with the album is Allvey. 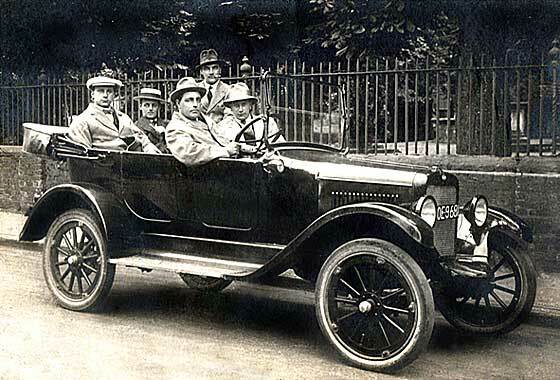 -- This one has remained doubtful but guessed at by John Warburton until a recent photo of a similar car in the Automobile was confirmed by Bryan Goodman and Tim Harding as a cca 1903 Belsize. Apparently the bolts through the rad are a Belsize fetaure of the time. 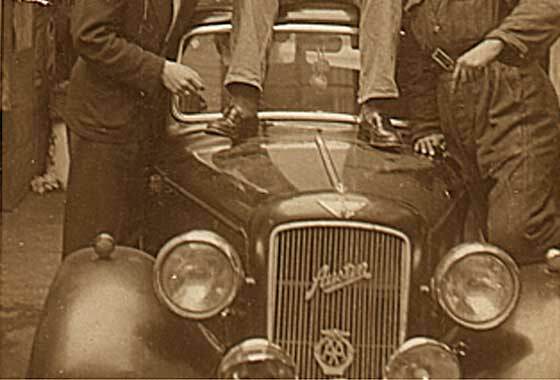 Photo received from Sally Morgan (UK) being a postcard showing a car being investigated in connection with her search for relatives of her grandmother in Scotland. Is it an Arrol Johnson? -- No, this is not a car made in Scotland but made in France. It is a cca 1903 Clement Rear Entrance Tonneau. History of Adolphe Clement was very complicated having had fingers in many pies including with Stirling's Motor Carriages, Glasgow, Scotland, where 200 early Clement-Panhards were imported. Photo posted by Dave Hodge (USA) on AACA asking for identification saying it was a family picture taken on Long Island in 1914/15. -- Not many American cars had circular radiators so it was a case of eliminating those that did. Left was the National which was built in Indianapolis, Indiana. They started in 1901 building electric cars and in 1903 built petrol driven. 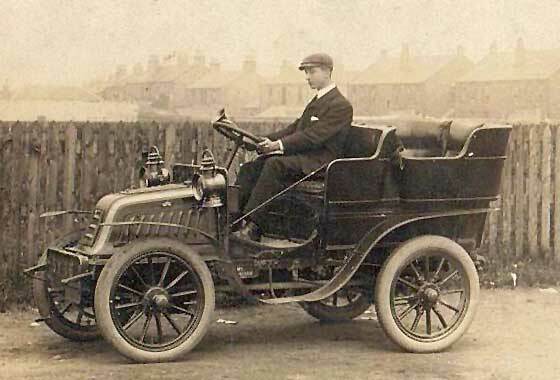 In 1905 bigger petrol cars with round radiators to 1908. 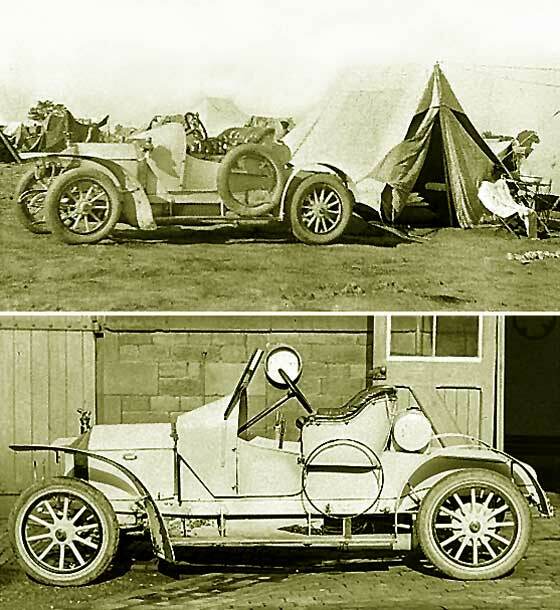 Bonnet length suggests pickup on a cca 1906 National Model C.
Two sets of photos received from Alan Weeks (UK) saying we helped identify Chevrolet lorries belonging to explorer Sir Philip Brocklehurst. They now have photos by his brother, Henry Courtney, The first at 1911 Delhi Durbar camp, other at Swythamley. Probably shipped home when the regiment went to South Africa in 1912 or returned England '14. --Car was manufactured in Belgium and many were exported to the UK, and had Vanden Plas bodies. This is a cca 1908 Metallurgique Roadster. Photos received from Alan Weeks (UK) saying we helped identify lorries used by explorer Sir Philip Brocklehurst. 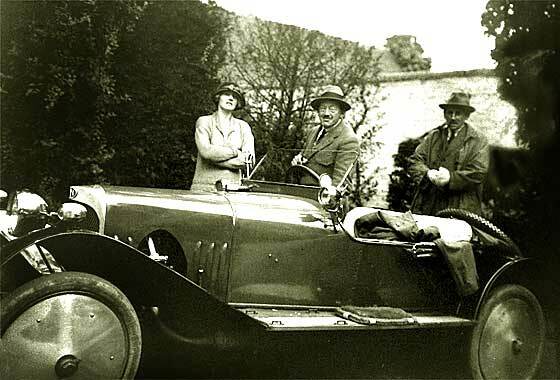 Photo taken by Courtney Brocklehurst, so car may belong to his brother, Sir Philip. -- Quite unusual impressive high quality car made in France. Registration was issued by London County Council in the summer of 1909. 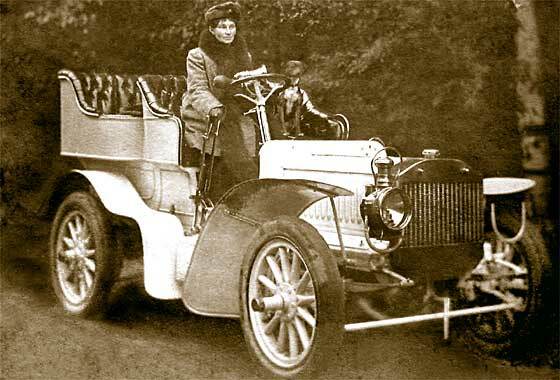 The car is a cca 1909 Lorraine Dietrich Tourer. Le Mans winners 1925 and 26. Car production ended in 1934, -aero engines started in WW1 went to WW2 ! Photo received from Margaret Burns of Herne Bay History Group (UK) searching on behalf of John Bent-Marshall the history of his Great Grandfather William Blackburn who bought a house in the area 1900 to 1918. 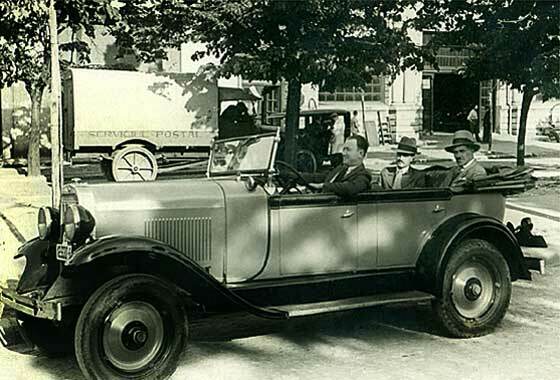 -- This is a French car built in Suresnes near Paris. We thought 12 HP but our John Warburton feels that 1.7 litres is just too small a capacity for this size of body. We can therefore advise this is a cca1910 Darracq 14/16HP Landaulette. Alexandre Darracq started in 1896. Photo received from Derrick Sutton (UK) helping his daughters future father in law with family tree. Date unknown, shows great grandfather Timothy Edward Hanlon, in 1911 Census as Motor Cab Driver. -- Reg no help in dating. Relatively sure this is a cca1910 Panhard Levassor 15HP Taxi built by W&G Du Cros company in Acton. Du Cros were a major taxi operator using mainly Napier and P & L cabs. They even had a fleet of Yellow Cabs with British Landaulette bodies. Later built commercials. Two sets of photos received from Alan Weeks (UK) saying we helped identify Chevrolet lorries belonging to explorer Sir Philip Brocklehurst . They now have photos by his brother, Henry Courtney. The first smaller car is visible in the background. -- Registration LF 3925 was issued by London County Council between 5'12 to 3'13. 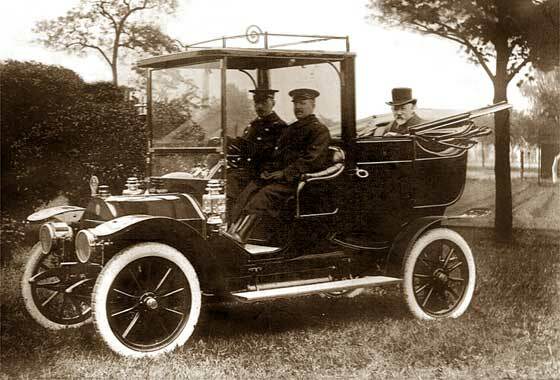 The car was therefore probably 1912 as it did not have the electrics which came in 1913. This is cca 1912 Metallurgique Speedster. The car in background is a 'third' car. Fascinating photo received from Cicos Florin in Constanta by the Black Sea (Romania) who is interested in old cars of Constanta. -- This imposing car, a cca 1914 NAG Tulip Tourer, was made in Germany by the Neue Autobobil Gesellschaft in Berlin. 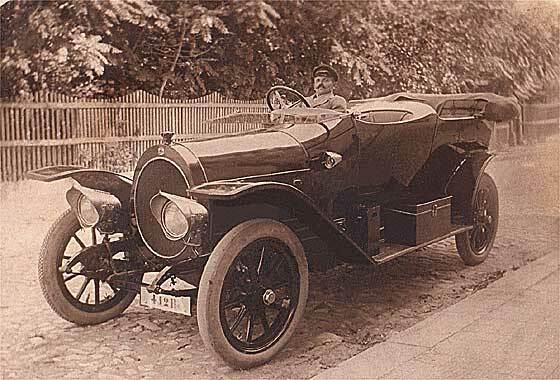 It was one of the largest vehicle manufacturing companies in Germany in 1914, and was a favorite car of King of Romania. 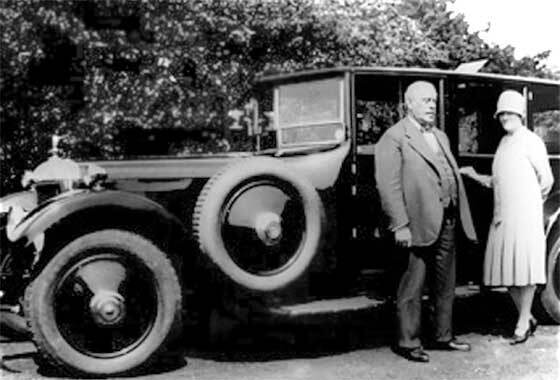 He purchased 17 NAG cars between 1905 and 1914. Very grand tulip body and large engine. Perhaps one of the Royal cars? 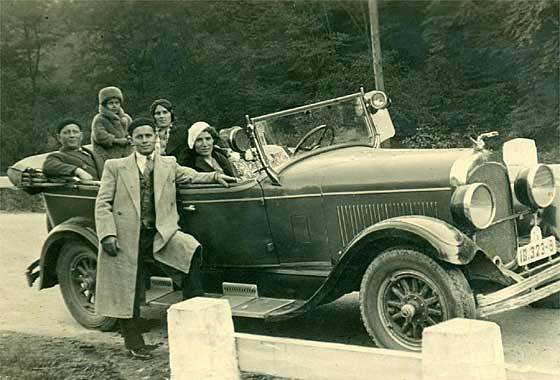 Photo posted by Eric Haartz (USA) questioning if this was a 1928 Bean? Sent to him by Ayton family in UK.-- Curved coachwork separate from dickey was largely over by cca 1916. Also, car had a square rad, which the early Bean did not. Predecessor to the Bean "The Perry" provides the answer. 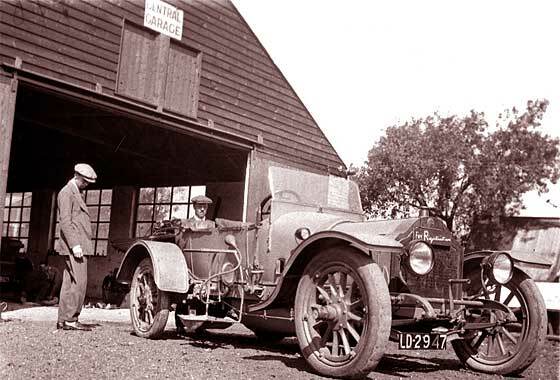 Perry, originally a pen maker, were bought by Bayliss Thomas, built the twin Perry and via Willys Overland sold Perry to Bean in 1919. Tim Harding is positive: cca1914 Perry Two-seater 8HP. While researching on the web for something else, came across this photo which was asking identification. Regret I have lost the info on the website, so cannot advise them directly. -- This is cca 1919 Premier Touring built in Indianapolis, Indiana by company started in 1902 and gone by 1914. Reconstituted but went again in 1923 despite making highly regarded cars. New owners decided to build taxis and got an order for 1000 Premier Taxi Cabs. Sold to National Cab & Truck in 1926. 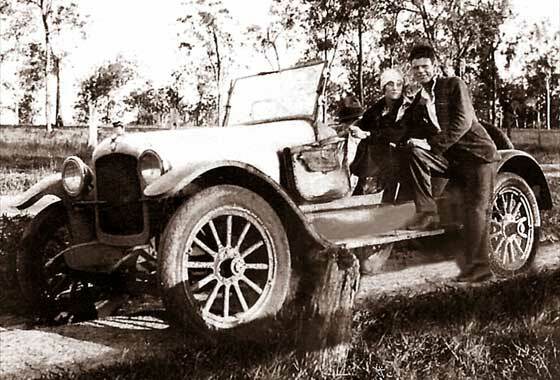 Photo received from Michael Plumb (Australia) showing his Grandparents in 1936 in Australia. Mother once said they had a Rover with a Dicky seat that they sat in. Would it be this car? -- This definitely is not a British Rover but there is some agreement from our friends at the AACA that this is USA made cca1919 Hupmobile Model R Roadster. There are certainly many pointers to suggest this is so but the body and door are wrong suggesting that the body mat have beeen made locally. Photo received from Roy Jones, Lyme Regis, Devon, (UK) saying what a great service we offer !! He attached a photo which he is trying to identify for his family history research. It shows his Uncle Fred on an outing. Judging by his age he thinks the photo was early twenties or thereabouts. Fred is in the standing group, far left. -- This photo helpfully shows the front wheel with 10 spokes and part radiator with bump indicating a cca 1920 AEC Charabanc, probably on Y Type chassis. 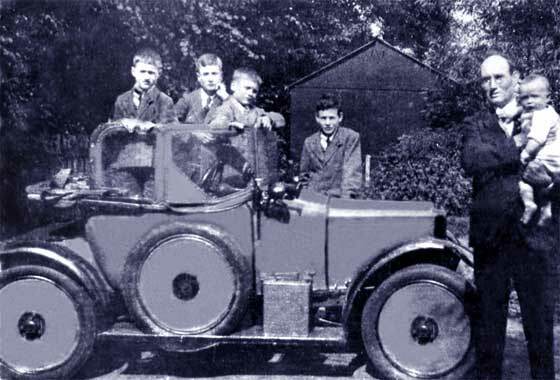 Photo Photo received from Colin Waugh (UK) which shows a car driven by his grandfather. He would like an ID to include in a family history he is undertaking. -- Registration was issued by Birmingham BC in 1920. The car is a cca 1920 Willys-Overland Model Four Touring. Model was between 1919 and 1922. Overland made in Indianapolis, USA, initially in a circus tent. The company was purchased by John Willys in 1912 and was renamed Willys-Overland. Second largest maker to Ford in 1916. Photo received from Alan Weeks of Swythamley Historical Society (UK) saying it was taken at Hydecroft, Lowfield Heath, near Crawley in Surrey, around 1920. Courtney's wife, Lady Helen but they assume the car belongs to one of the two unknown men.-- Quite an unusual car but a well known make. The car is a cca 1921 GN Sports V Twin, 1100cc. 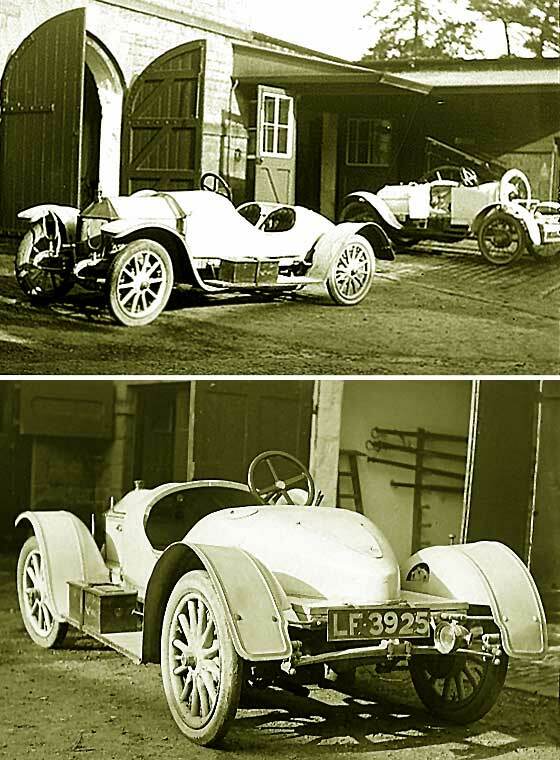 GN were the first/best British cyclecar. Made in Wandsworth, London, by Godfrey and Frazer-Nash. Made at 58 a week in the 20s, - closed 1925. Photo received from Brett Payne Tauranga, (New Zealand) saying we helped in the past and could we please do again. 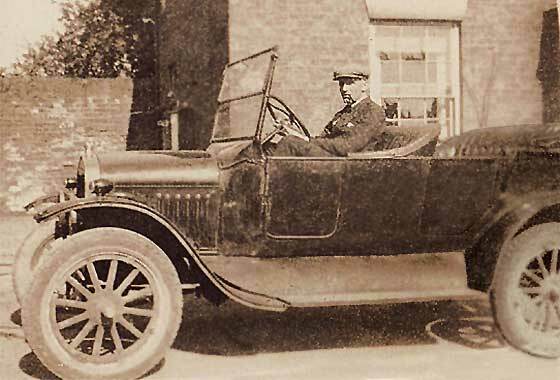 The photographs show his grandfather in the driver's seat of a motor car, probably in Derby, England. It may have been taken in the late 1920s. Could we advise make/year of the vehicle? 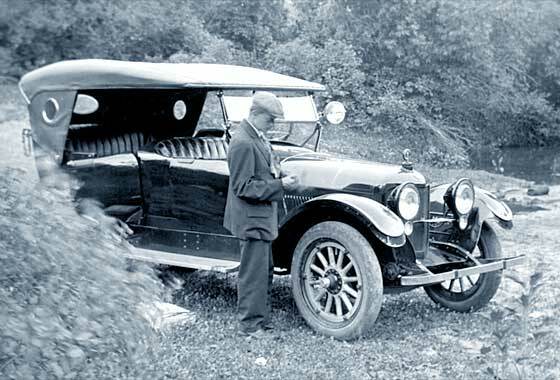 -- The car appears to be a Model T Ford Touring and various body aspects suggest a build year of cca 1923. As this could be a Ford car built in the UK, style may be a year or so later. 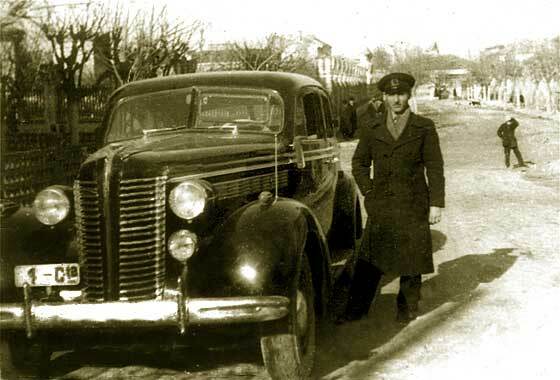 One of a number of photos received from Cicos Florin in Constanta by the Black Sea (Romania) who is interested in old cars of Romania and Constanta. -- This photo shows another Taxi from Bucharest at a market with interesting national costume designs in the background. 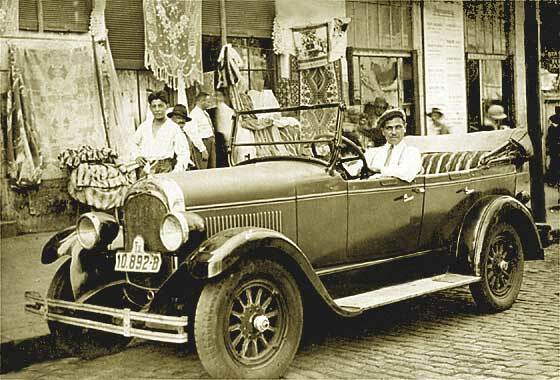 Initially thought as a '24 Chrysler B70, we have been advised by Mark Dawber that due to bullet shaped headlamps, four bolt hubs, and short gap between doors, this car is cca 1926 Chrysler 60 Four Door Touring. Interesting photo received from Cicos Florin in Constanta by the Black Sea (Romania) who is interested in old cars of Constanta. 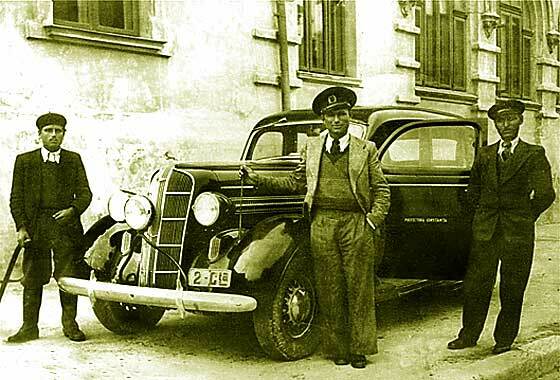 -- This photo shows a Taxi from Bucharest with a proud driver. The photo also helpfully has two Nash badges which again make it an American car. The mudguards have a profiled shape which makes it pre 1927 and the radiator shape and badge suggest it is a cca1926 Nash Advanced Six Touring. Nash were in Kenosha, Wisconsin, and were initially "Jeffrey". One of a number of photos received from Cicos Florin in Constanta by the Black Sea (Romania) who is interested in old cars of Romania and Constanta. -- This photo shows another Taxi from Bucharest probably being used by the owner socially. It is again an American car and again a Chrysler. From the drum lights and ribbed mudgurds it looks like a cca 1926 Chrysler Series 60/70 Four Door Touring. By 1928 the radiator was entirely different. Was the seventh largest car producer at time in USA. One of a number of photos received from Cicos Florin in Constanta by the Black Sea (Romania) who is interested in old cars of Romania and Constanta. 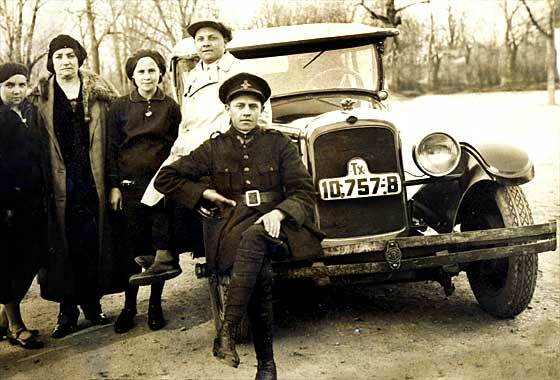 -- This photo shows another Taxi from Bucharest. 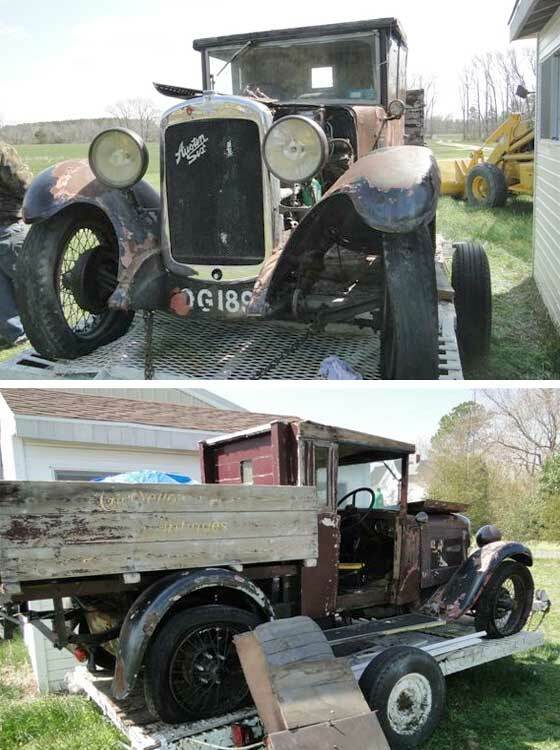 Our friend Casper at the AACA helped to advise this is a cca 1928 Oldsmobile F28 Touring. Interesting to note it has disc wheels. 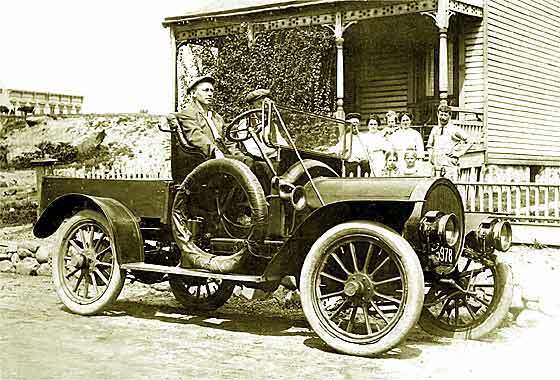 Olds made his first car, a steamer, in 1887 and first petrol in 1896. First Oldsmobile in 1901. In 1904 he left and formed REO and outsold Oldsmbl to 1917. Became GM. Matt from Virginia Beach (USA) has just purchased this vehicle originally from UK. What can we tell him. -- Reg OG 189# was issued by Birmingham County Borough Council (UK) in 1930. Our colleague Jim Stringer of the Vintage Austin Register advises this is a 1930 Austin 16/6 originally an open tourer. TT in the car number indicate a Tourer and Twelve chassis but /6 indicates it is a 'Six-Sixteen'. Look for date on rear axle diff casing for when chassis left to have saloon body fitted. Fascinating photo received from Cicos Florin in Constanta by the Black Sea (Romania) who is interested in old cars of Constanta. -- This car which is about to get a wash is a car belonging, according to the writing on the door, to the Constanta Prefecture. The car was made in Detroit, Michigan, USA, and is a cca 1936 Dodge Four Door Sedan. Dodge Brothers supplied bits to, and has shares in Ford, sold them and started 1914. Both died 1920, widows sold to bank, - and bank to Chrysler 1928. Photo received from Mary Hoban (UK) who has been asked to make a wedding cake in the shape of the car in the photograph. Could we identify the model so she could then find appropriate photographs and dimensions to make a template. -- Rounded windscreen, so post 1935. Registration AVL is 1938/9. Does not have a 'Six' script on the rad so it is a four cylinder. There was a range of Austins in that period with 'town names' but I think this is a cca 1938/9 Austin Cambridge 10/4 Saloon. Fascinating photo received from Cicos Florin in Constanta by the Black Sea (Romania) who is interested in old cars of Constanta. -- This photo also shows what appears to be an official car by the flag carrier on the wing. Like the earlier Prefecture car, this car is also American having been made in Flint, Michigan. It is a cca 1938 Buick Four Door Sedan. Buick started in 1903 making marine engines. Cars 1904, also in Canada 1908 and London 1909. By 1938 they were making 300,000 cars / year. Regretfully this photo has been doing the rounds of our experts for so long that I have lost details of who sent it to us. Very sorry but we get so many enquiries it is sometimes a bit difficult to keep track. -- None of our experts have come up with a positive identification because the picture is a bit small and blurred in definition. 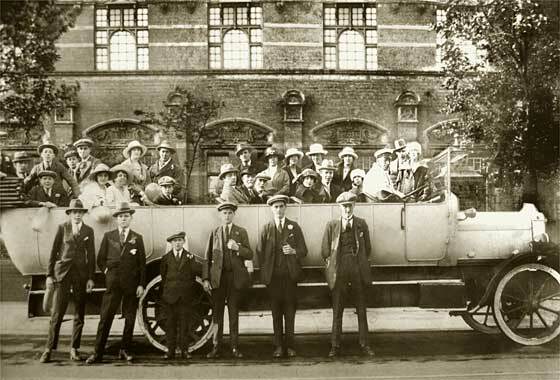 I feel that this is probably a cca 1928 Minerva Limousine. Minerva was built in Belgium but many were imported to UK and bodied here. Looks like a London Cunard body.